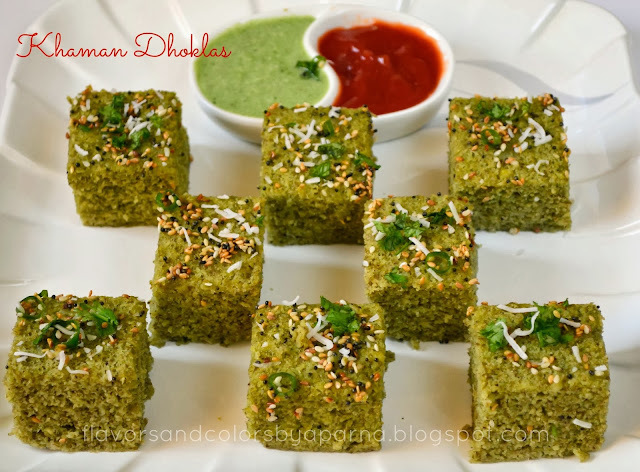 Dhokla is a popular Indian snack from the state of Gujarat and traditionally made with base of fermented rice and chana dal mixture. These days you will find many variations been done, like khatta dhokla, cheese dhokla, rasia dhokla, sandwich dhokla. They are made from different dals, suji or semolina and the instant ones are made from chickpea flour/besan. I thought to give a try to its recipe from here which I had bookmarked few days back. While going through the recipe I got confused - the recipe had no rice in it and had no fermentation mentioned in its steps so,,, will I be preparing a Dhokla or Khaman dhokla ? You too confused ??? Whatever it is... I would call them steamed savory CAKE. This was an easy recipe resulting in spongy delicious savory cake [steamed them in cake pan and so the name :P] infused with sugar lemon juice solution and they made a great evening snack with tea. So lets go to yet another nutritious recipe now. 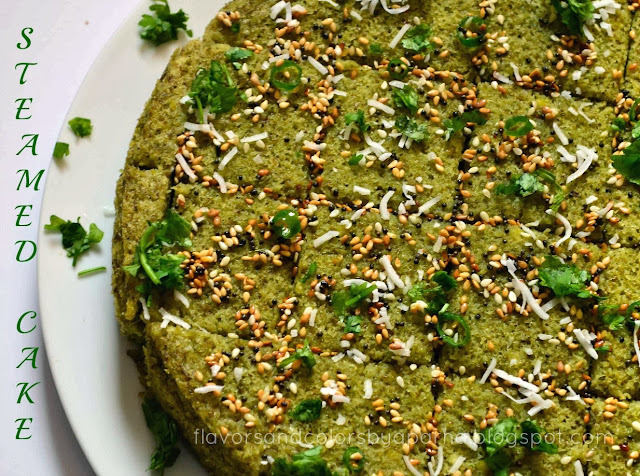 I haven't changed the recipe except adding little more of coriander leaves [to get a deeper green color] than mentioned in the recipe, little besan and sugar in the batter/mixture. Wash and soak the whole green gram in enough water. I kept it for 5 hours. Drain and grind them with green chilies, ginger, chopped coriander leaves with very little water to a paste of semi coarse consistency. Now add turmeric powder, sugar, lemon juice, chickpea flour, asafoetida, oil, salt as per the taste and mix well. The batter should be like an idli batter neither too watery nor too thick. 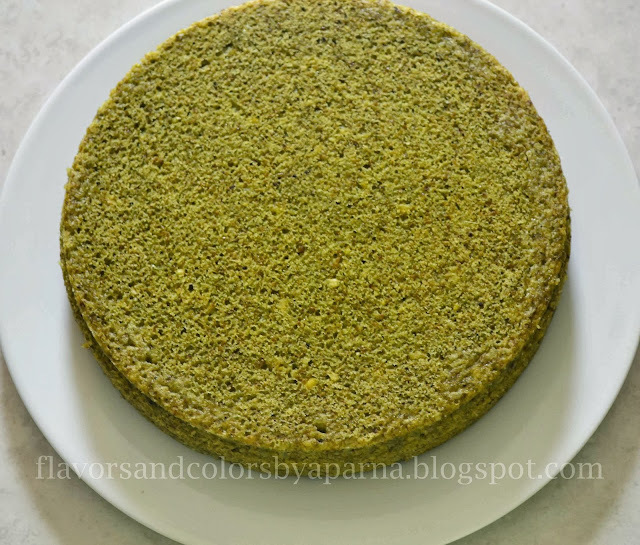 Grease your dhokla stand/ idli plates or cake pan with some oil. Add eno to the batter just before steaming and pour it in the pan. Steam it for 12-15 minutes [just like steaming idlis] until they are done. Switch off the flame and allow it to cool. Invert it on serving plate or tray. 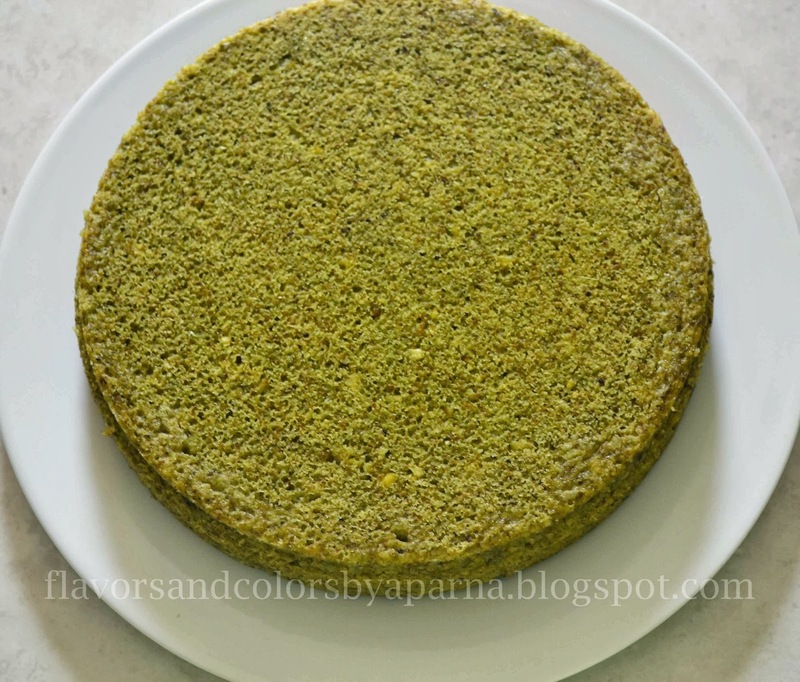 The steamed cake would look as seen in the below pic. Cut them into desired shapes. 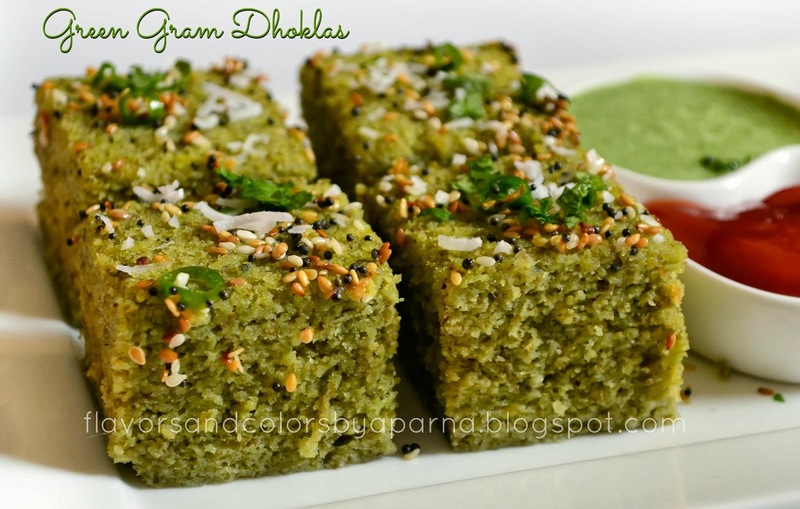 Once the dhoklas are steamed, prepare the sugar solution and seasoning. Add sugar, lemon juice to 4 tbsp of water and mix it till all the sugar dissolves completely. Heat oil in a small pan. Add mustard seeds. As they begun to splutter add curry leaves, finely sliced chilies and roasted sesame seeds. Add the sugar solution to this seasoning and switch off the flame. Slowly pour this seasoning on the top. Serve them garnished with chopped coriander leaves and fresh grated coconut [optional] accompanied by sauce or chutney.